In the flush of the current presidential campaign, when crowds of blacks and whites caught up in Obama fever chant together, “race doesn’t matter,” and even the mainstream media seems delirious with the possibility that the U.S. may be poised to elect its first black president, it’s hard to remember that only a few months ago college campuses, high schools and workplaces from Louisiana to New York were sites of racial intimidation. 2007 was the year of the noose. Dozens of incidents, in which nooses were hung in places designed to intimidate black workers and students, seemed to engulf the country. Many of these noose hangings seem to have been set off by the case of the Jena Six -- a Louisiana case in which black high school students faced serious criminal charges after a series of violent conflicts with white students. The friction between the students arose after white students hung nooses from a tree that had long been regarded as reserved as a meeting place for white students. Many whites minimized the noose hangings at Jena and in other places as mere pranks. Blacks, by and large, regarded the noose hangings as hate crimes – messages of intimidation and white supremacy inspired by the nearly 5,000 lynchings of black men and women that took place in the 20th century. The timing of the President’s statement was curious. Months earlier, when noose incidents were on the front page of major newspapers every day, a presidential statement denouncing the display of nooses would have been a powerful and authoritative repudiation of racist symbols. Yet at that time, the President was silent on the issue. As a result, President Bush’s statement last week seemed strangely out of time. It read like a random selection from a stack of draft presidential statements, hauled out for Black History Month. Clearly drafted months ago [and perhaps embargoed for unknown reasons], the President’s statement provided no guidance on how to reconcile the rash of noose displays four months ago with the current mood of racial harmony and possibility sweeping the country. The question of whether and how much the history of 20th, and even 19th century violent white supremacy is relevant to the lives and condition of blacks and whites today is a pressing and important one. The exciting presidential candidacy of Senator Obama threatens to seduce us into a false sense that racism is America is a thing of the past. But America has always had this dual relationship with race. Our response to race has the potential either to mark us as the most mythically transformative country ever created, or condemn us as eternally mired in a doomed creation story, in which the defining history of slavery marks us forever. We stand at the crossroads of these two possibilities. Obama calls us to hope – to the great potential of the U.S. to shed the confining shackles of racism, and to accept a black man as national leader. But last autumn’s rash of noose incidents reminds us of the other, darker side of America’s continuing struggle with racism. There are nearly 10,000 hate crimes reported to the FBI every year – most of them racial in nature. 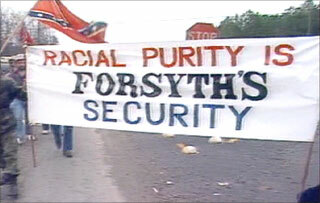 Contemporary expressions of racial hatred are intrinsically connected to the history of violent white supremacy in this country. Our ability to understand and eradicate the effects of white supremacy and its contemporary violent forms of expression are directly connected to our understanding of this history. My book, On the Courthouse Lawn: Confronting the Legacy of Lynching in the Twenty-first Century, makes the case that towns and communities throughout the U.S. continue to live with the effect of 20th century lynchings. I argue that only by confronting that history and its contemporary effects, can we exorcise the hold of lynching on the relationship between and among black communities in the towns where lynchings occurred. Beginning on Tuesday night we have an opportunity to explore another important aspect of America’s racial history when the film Banished begins airing on PBS stations as part of the Independent Lens series. The film’s director is Marco Williams, the talented director of The Two Towns of Jasper, a film about the black and white communities in Jasper, Texas after the lynching of James Byrd in 1998. 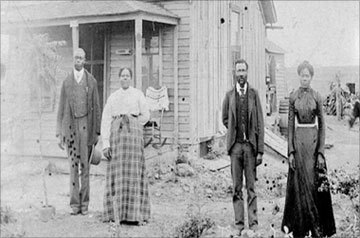 Banished tells the story of 3 U.S. towns that violently “banished” their black population 100 years ago. We hear from the descendants of black families who were expelled from these towns, and from white residents who currently occupy the land formerly owned by black town members. The film hints at just the tip of a broader phenomenon in U.S. history. Historian James Loewen, author of Sundown Towns: A Hidden Dimension of American Racism, has estimated that over 10,000 U.S. towns violently or illegally prohibited blacks from living within their borders. Loewen’s meticulously researched book suggests that this practice continued well into the 1970s. The effect of this displacement on the material condition of black families, who often were compelled to leave towns, abandoning their land, homes, bank accounts and other assets, has never been comprehensively examined. The rise of the Obama candidacy is, without question, a positive political and cultural phenomenon in the U.S. But the economic, educational and political divide between whites and blacks is still alive and well. America’s dual relationship with race enables us to reach the highest levels of racially harmonious symbolism, even as we remain in struggle with our worst racial impulses. The challenge for 2008 and beyond is for us to embrace the hope represented by the widespread acceptance of public figures like Barack Obama and Colin Powell, while continuing the hard work of sorting through the lingering effects and reality of white supremacy in our society. Banished begins airing on PBS stations on Tuesday, February 19, 2008. Go to www.pbs.org/independentlens to find out when Banished will air on your local pubic television station. Sherrilyn Ifill appears in the film. 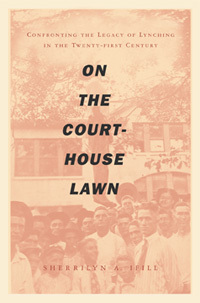 Her book, On the Courthouse Lawn: Confronting the Legacy of Lynching in the 21st Century, is now available in paperback.